Six Months ago (in Law Journal time), we published an article entitled The Myth of the Rational Borrower, 84 Texas L. Rev. 1481 (2006). In that article we looked at macro-data, the economic literature on consumer credit that informed BAPCPA, and the oh so hip literature on behavioral economics to explore the argument -- familiar to readers of this blog -- that rational lenders use sophisticated marketing techniques to exploit consumers' lack of information and imperfect decisionmaking processes and encourage excessive consumer borrowing. We further sought to consider whether this, and not consumer opportunism, might be the engine behind the bankruptcy filing rates observed prior to 2005. One of the few good things about BAPCPA is that it has offered us a found empirical experiment with which to test our hypothesis. One of our projects this week is to lay out a short form version of the argument we made in "Myth", and to publicly evaluate our predictions in light of the three quarters of data that are now available following BAPCPA's enactment. So first the short form argument . . . Being academics who sometimes write about public choice theory, our discussion starts with a 2x2 policy space. 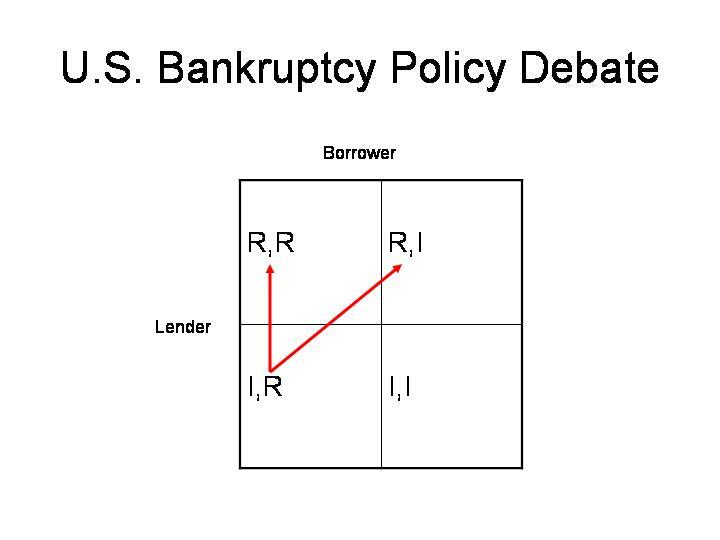 That space is populated by two types of people -- "Lenders" and "Borrowers," who may be either rational ("R") or irrational ("I"). We then ask, "Which permutation/quadrant/box best describes the world we live in?" We started in the lower left hand box by taking the proponents of BAPCPA at their word. These advocates (we won't name names) spin a tale of rational, opportunistic borrowers ("deadbeats") who use the bankruptcy discharge to walk away from their debts. Lenders in this world are helpless to distinguish honest from dishonest borrowers, and in turn pass the costs of the bankruptcy discharge on to honest consumers in the form of higher credit costs. 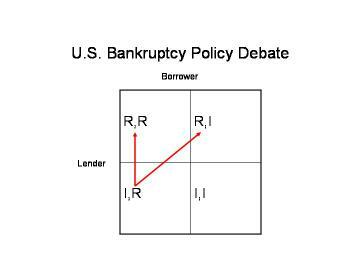 The combination of "rational" borrowers, "informationally impaired" lenders, and the bankruptcy discharge produces the so-called "bankruptcy tax," and leads to the policy prescription implicit in BAPCPA -- limit access to the bankruptcy discharge. A brief look at the history of consumer credit convinced us, however, that while the story of impaired lenders may once have been true, it isn't any longer. Prior to 1978, credit reporting was in its infancy, and the Supreme Court had not yet handed down its decision in Marquette National Bank of Minneapolis v. First of Omaha Service Corp., 439 U.S. 299 (1978). The Marquette decision declared that consumer lending relations would be governed by the law of the jurisdiction where the lender was located. Prior to Marquette, consumer lending was local, as was consumer credit information. That was then. We now live in a very different world. Credit reporting, credit scoring and consumer lending are national in scope. At the very least, we seem to have moved from the bottom-left quadrant to the top-left. In a world of rational lenders, rational borrowers and symmetric information, efficiency might be improved by increasing the cost of default, but that box may not capture reality either. The key question for us became whether consumers are rational and opportunistic, or themselves suffer from decision-making limitations and biases. If they do, then we would move the policy discussion to the top-right box. To answer this question, we looked to the relatively new cognitive psychology literature, that suggests consumers' borrowing, purchasing and default decisions are not fully rational. This post is already getting too long, so we'll save the discusion of heuristic borrowers, time inconsistent preferences, etc. for later in the week. However, by the end of the Texas article we found ourselves making a number of predictions about consumer behavior based on concerns that borrowers might be less than rational. 1. While making bankruptcy more expensive and less effective may well lead to substitution from formal to informal bankruptcy and the bankruptcy filing rate should fall (no surprise here), this will not have a significant effect on consumer borrowing decisions. 2. Thus the bankruptcy filing rate would not reflect a change in the amount of financial distress, so credit card chargeoff rates and other metrics of financial distress should be relatively unaffected by BAPCPA. 3. Consumers' ex ante borrowing decisions should not be affected by the cost of the bankruptcy discharge, so overall levels of consumer leverage should not be affected by BAPCPA.